Anyone else excited about GCN classic Trek to Superbike series? I'm willing to cut the project some slack since he probably has specific mandates built into it by their sponsors (Shimano, spray bike, but definitely not trek since he sprayed over their logo :0). But it is disappointing that he isn't getting into the nitty gritty of deciding which parts should stay and and which should go...if all he's doing is swapping a groupset in where is the expertise and what are we supposed to learn? The silver lining through this is that if anyone is inspired by this video series is that there are hundreds of threads across different cycling forums that will serve as a better guide, and are easily found when to googling. I descended Thunder Ridge, including Hwy 43, in the rain, on single pivots (7401). No sympathy needed, just better calipers. I was half expecting @rccardr to be calling SAG and then someone looking up the emergency contact for me.... I'm sure the key is to go slow, but once you let up on the brakes on that descent, you're not getting them back. With the brake lever pulled to the bar, I couldn't keep the bike below 35 mph in some corners that literally drop out of sight until you're in them. At the same time, watching your front wheel skate from the inside of a R turn all the way across the road, on chip seal, is not fun. You were using BRAKES on that descent? 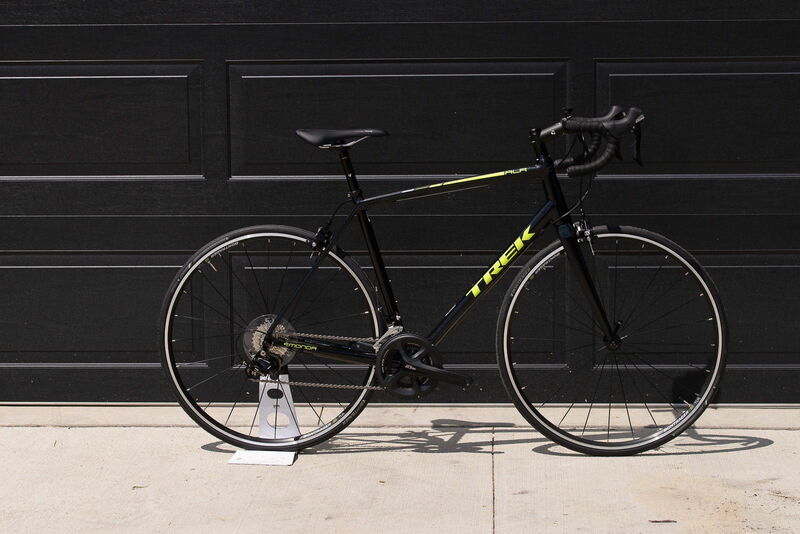 Found a Trek Emonda ALR 5 for $1000 (under budget). Super light bike, great rider, handler, climber, accelerator, great value, looks good. Mentioned it before and did a search just a little bit ago. Didn't take to long to find it! I think it's a decent project for making a video, and I'm enjoying the expressions on his mates' faces as much as the content. It is entertaining; I just wonder how more/less entertaining it is to BF C&V as compared to others. It may convince a few folks to venture more into the used bike market vs. drop donero on an average bike to make it a better average bike. The "superbike" idea is sort of tongue-in-cheek, anyway, because, basically, "superbikes" sort of mean "best stuff," and that's just not going to happen for $1100. I'm glad they're doing it, and I'm watching. Fun stuff. As for a superbike build, a fast, fit lady asked me to build her a "superbike," based on a model that sold for $6000 in 2016, came with a mix of Ultegra6800/DA9000, and very little carbon other than the frame and Roval wheels. I scoured, scavenged, salvaged, and found the frame NOS in Haifa, Israel. I scoured, scavenged, salvaged, and found carbon bars, saddle, post, stem, crankset, cages, brake levers, and went DA9000 except for a 9100 RD, and two sets of fully set up wheels, Zipp 60's and some training Fulcrums. It's her "superbike," and that's enough for me. It was fun, interesting, frustrating, but she ended up with a "superbike" for $3250, 90% new, after sell-off of the original parts. This included new Look pedals. That would have been a decent video, but probably, a bit hard to get into 9-minute segments. So, if you venture into a W Florida triathlon, and a blond ponytail on a lime green Specialized Alias Pro in full carbon TT/Tri goes by you....well, don't blame her for being fast. Blame me, I could use the cred. Well actually, yes, I was expecting something more like that given the phrase "superbike" in the title. I'm more disappointed that he spent money on brake calipers, front derailer, wheelset, and seatpost that aren't much improvement over what they're replacing, and new bars and stem without first finding out if the old ones would be okay once they were angled more naturally. Then he could have done something more useful with the project budget like lighter wheels, carbon fork, lighter crankset, etc. That's probably where they needed to define the goal from the beginning. Superbike could mean a lot of different things and those of us that watch the Tech side are likely deep enough into the hobby that we could follow that type of build with enthusiasm vs a just a new group off the web. Was I the only one surprised by how he pronounced "Celeste"? Or am I just showing my naivete? The British botch (or bodge) foreign words far worse than Americans do, so don't listen to them. I cringe when I hear them pronounce foreign words. Yeah never let the brits give you Vitamins or Aluminum and they may try to convince you two weeks is a Fortnight …. I have to admit, on Netflix, Amazon Prime, etc, I have to replay some scenes to understand what they're saying if it's a British or Australian or New Zealand movie or series. However, the majority of them are pretty good, once you figure out what they're saying. Last edited by RobbieTunes; 03-12-19 at 02:45 PM. @RobbieTunes, I keep English subtitles on. At least it's not James ("Hank") pronouncing Campagnolo "Cam-pan-YAL-o"
I like James as a presenter and general dude. But man, even my American tongue, which feels like it steamrolls other languages despite best intentions, can get Campagnolo correct. Thankfully. So we start with an old aluminum (or "aluminium" in the UK) Trek frame with limited fatigue cycles left in it from the era of birthday cake icing welds? And then it's poorly painted to look like a Bianchi with an old generation of Shimano 105 and some ugly alloy wheels? That's one super bike! Yeah, I'll still watch. I'd probably do the same project at home, but without the Celeste color scheme. Thanks. I'm up to date and I like it. I never liked that Trek model, and I'm not a fan of Celestial Seasoning, but the bike is OK.
Last edited by RobbieTunes; 03-18-19 at 10:23 PM. Regardless of how I feel about the rebuild, ep 4 was a very good production. Especially watched at 1.5x. Mostly 105 with non-model-specific Shimano brake calipers. Dang. He could have easily swung plenty of Dura-Ace for that money. Full Dura-Ace. Not 11-speed, but 7900 if he played his cards right. Did that with my Prologue. Regardless...this was a great video. He knows how to build up a bike and does a great job explaining it. Since we're all a bunch of DIY guys, this is old hat. To the generation or demographic of GCN that @RobbieTunes indicated is more "do what they've told you to do/what works," (aka not some fools who put electronic shifting on a 45 year old frame...) I think this video helps them a lot and lets them mentally be able to walk through the build process. Demystification and all that. The "chocolate chip mint" color scheme looks good, and the GCN-specific graphics are an immense help. The proportion is there, and the color scheme works, so the bike will look good. It should perform well enough, too. They keep showing and talking about Chris Opie having ridden the bike in its original state, but there was no video. I can't find it. I just hope they're talking about it when they do make the "after" video, showing Chris riding it before and then after. Full comparison. I believe this is willful and has much to do with centuries of war with France... because they’re especially bad with French. Pretty slow going. Still building in episode 4?? The first paint job was a bit funky. At least they didn't go with matt black for the second paint job. I'm a bit surprised about a lot of the choices. Vintage Aluminum vs Vintage Carbon Fiber vs Vintage Steel? 105 vs Ultegra vs SRAM vs Campagnolo Chorus/Record/SR? The goal seems to be to utilize many of the compromises and choices that a home builder might choose. However, I believe that ultimately they'll fall quite short of the "Super Bikes" like many of the other episodes feature. The bike will probably weigh in about 20 or 21 lbs vs 15 lbs for the other bikes on the show. It still will be interesting to see what their road test conclusions will be. I found the final couple of episodes of the series (I think). They kind of fudged on the initial testing of the bike. They didn't like the tires? But, why not simply upgrade the tires for $50 to $100? Tuning issues affecting their testing? Nonetheless the actual before & after differences as well as their comparison to the "super bike" were impressive. The goal, of course, was to make an average cost build. So, they did take a lot of shortcuts such as using a 105 groupset when there are better alternatives for a "super bike". I'm not a huge fan of the Celestial Teas series either... thought I'd might as well throw that onto the celeste bonfire too. They kind of fudged on the initial testing of the bike. They didn't like the tires? I got the feeling that the tires were like 10 years old... who's going to like the ride qualities of any 10 year old tires? I've gone decaf... that must be my problem. I did the opposite and got a super bike frame and put less than super bike components on it ( Ultegra 10 speed). 15.5 lbs as it sits with no carbon fiber components. I have it dialed in with a couple of short two mile rides, then today, we have thunder storms. I will be doing some Strava evaluations between my fastest bikes this summer. Time to find out for myself if modern is really better. Last edited by Steve Whitlatch; 04-07-19 at 10:21 AM. Interesting, with all the GCN upgrades, they were able to tip the scales at 9.02 Kilos, or 19.8 lbs. So, they did break the 20 lb threshold, but certainly on the heavy side for a "super bike". I wonder what the difference is between the Aluminum Postal bike and the Carbon Postal bike. GCN was trying to go for a 'super bike.' Whether or not that was achieved would make it classified as such or simply a very nice bike. I dislike the fact that they tested the bike 'as is' without any tuning up. Like, seriously, 5500-era Shimano 105 in a decent state of tune will not slip gears or 'be scary' or any of that stuff that Chris Opie (c'mon man, you're better than that!). All of us at C&V have bought a bike that we knew was not in ideal tune, restored it or refurbished it, and made it work well/properly with the pieces it had (just with new cables, housings, pads, tires, chain, and tune, if any or all of those). I, like many of us here, am not so dense that I buy a tired Colnago with SR in a poor state of affairs, ride it once in said poor state, have a bad time, and then completely write off the bike as rubbish, proclaiming, like a drooling moron that now "all Colnagos are bad." In the end, the performance delta/difference was very small, especially given the fact that the Orbea was what it was--a $9000 bike vs a $1000 hot-rod affair. I still say that Jon could have snagged some 6800 if he played his cards right, but 5800 is fine. Just buy a used Trek Emonda ALR for the same price, people. Near-super bike performance at a fraction of the cost ($1k or just over depending). At any rate, I'm going back to my steel. Not as snappy or as light as carbon, but it still loves its rider a whole lot (more), and looks great out on the road, thirty plus years on.